LAS VEGAS, Jan. 12, 2019 /PRNewswire/ -- CES 2019 is still appealing and exciting, and Chinese companies are playing more and more important roles in it. Almost one-third of the exhibitors are from China. Especially in the popular autonomous driving industry, Chinese companies are overtaking their competitors with a dramatically fast speed. 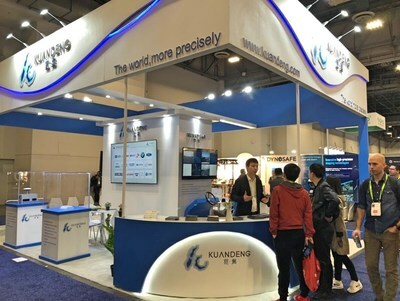 At this CES, Kuandeng Technology from China, as a representative of companies in the field of high-precision mapping, showed the core advantage of innovative high-precision map products and technologies to users around the world. It demonstrated the competence to be the best partner for automakers who wish to explore autonomous driving market in China. Kuandeng Technology holds core AI centric technologies such as deep learning, 3D vision, image recognition, robotics, automatic map construction, map cloud services, etc.. The platform can quickly build high-precision maps without large-scale human efforts. The company has become a leading service provider of high-precision map integrated solutions. The centimeter-level high-definition pre-installed map solution integrates data such as lane type, lane width, landmarks, fences, road edge type, in addition to the basic information including lane shape, slope, curvature, pavement, and direction. The high-precision localization module acquires the image through the camera, extracts the map elements through the sensing module, compares it with the high-precision maps, and combines the GPS, IMU, and wheel speed signals to acquire the precise position and pose of the vehicle in the high-definition maps. The crowdsourcing module is divided into two parts, namely the vehicle side and the cloud. The vehicle side collects vectorized maps, poses and other information, and transmits them back to the cloud. Through intelligent regional segmentation and hierarchical spatial clustering, the high-definition maps are generated. It solved problems such as collection cost and update frequency. In addition, mapping is a field that highlights a combination of technology and experience, and it requires a large amount of industry accumulation. The construction of high-quality and high-precision maps is inseparable from professionals from the mapping industry. Kuandeng Technology has also attracted a large number of graduates from the world's top universities with mapping background. Users of high-precision maps are automotive manufacturers. The certification period is long and the cost of replacing a supplier is high. Kuandeng took the initiative to establish cooperation with major automakers and tier-1 suppliers, and continues to maintain first-mover advantage.